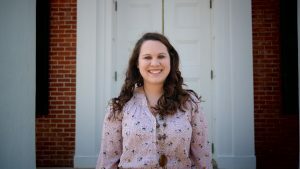 When Megan Stidd began writing her senior thesis for the Sally McDonnell Barksdale Honors College at the University of Mississippi, there were no examples in the thesis repository for her to follow. She was the first student with a criminal justice major to write an honors thesis, and she had to break new ground. “Thankfully, I had some wonderful professors in the legal studies department to guide me through the process,” said Stidd. With her professors’ help, Stidd made history by becoming the first student in the honors college and legal studies department to finish a criminal justice thesis. Her thesis, “The Attitudes and Awareness of Sexual Assault, Relationship Violence, and Bystander Intervention of Undergraduate Students,” found Stidd surveying more than 30% of the undergraduate student body about sexual violence. Megan Stidd graduates from the Sally McDonnell Barksdale Honors College in the class of ’16 with a Bachelor of Science in Criminal Justice. A Texas native, Stidd was originally attracted to UM due to the welcoming atmosphere on campus. She learned about the honors college during the admission process and applied as an oncoming freshman. To graduate from the Sally McDonnell Barksdale Honors College, a student must maintain at 3.50 GPA, as well as complete community hours and a senior thesis. While pursuing her degree, Megan undertook an internship at North Richland Hills Police Department. There, she received experience in dispatch, corrections, and criminal investigation. Dr. Mark Loftin, associate dean of the school of applied sciences, praised Stidd’s hard work in the legal studies department and school. “This experience will prepare her well for employment and other advanced academic degrees. She is fortunate to have the expertise and guidance from the faculty at legal studies and the University of Mississippi” Loftin said. For the future, Stidd has been accepted into the master’s program at the University of North Texas in criminal justice. She hopes to become an analyst in the field of crime or terrorism.